Thank you for visiting the website of the Chiltern Concert Band. 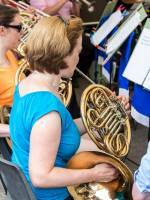 The Chiltern Concert Band is a community wind band based in High Wycombe, Buckinghamshire. The band was set up in 1982 to give the opportunity to adult musicians to continue in a high standard musical ensemble beyond their school and college days. The band plays a wide range of music including marches, well-known film and show selections, solo items, popular classics as well as more recent wind band repertoire. We had an excellent audience at our 8 December concert in Little Marlow. Their percussion skills were particularly impressive. The music was festive, and there were lots of mince pies, good cheer and sleigh bells. The concert raised over £500. Saturday 30 March 2019 at Marlow Parish Church, Marlow, SL7 2AA.